How can we boost the business in the worst economic period many of us have ever experienced? For many, this might sound too daunting — an option mired in red tape and overwhelming complexity. However, as someone who has built a solid amount of business overseas, I encourage you to consider the possibilities before reverting to your comfort zone. Let me share with you the steps you might want to consider. I am in the business of cremation equipment and have been for more than 30 years. 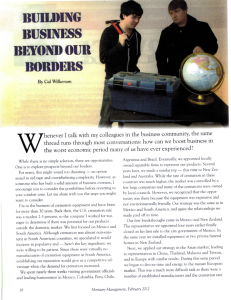 Back then, the U.S. cremation rate was a modest 2-3 percent, so the company I worked for was eager to determine if there was potential for our products outside the domestic market. We first focused on Mexico and South America. Although cremation was almost non-existent in South American countries, we speculated it would increase in popularity and – here is the key ingredient: we were willing to be patient. Since there were virtually no manufacturers of human cremation equipment or animal cremation equipment in South America, establishing our reputation would give us a competitive ad- vantage when the demand for cremation increased. We spent nearly three weeks visiting government officials and leading businessmen in Mexico, Colombia, Peru, Chile, Argentina, and Brazil. Eventually, we appointed locally owned reputable firms to represent our products. Several years later, we made a similar trip – this time to New Zealand and Australia. While the rate of cremation in these countries was much higher, the market was controlled by a Few large companies and many of the crematoria were owned by local councils. However, we recognized that the opportunity was there because the equipment was expensive and not environmentally friendly. Our strategy was the same as in Mexico and South America, and again the relationships we made paid off in time. Our first breakthroughs came in Mexico and New Zealand. The representative we appointed four years earlier finally closed on his first sale to the city government of Mexico. In the same year, we installed new crematory equipment at two private funeral homes in New Zealand. Next, we applied our strategy in the Asian market, leading to representation in China, Thailand, Malaysia, and Taiwan, and in Europe with similar results. During this same period, we began to devote time and energy to the mature European market. This was a much more difficult task as there were a number of established manufacturers and the cremation rate in the industrialized countries exceeded 50 percent However, the equipment was overpriced and not as environmentally friendly as our units. We persisted and by the mid-’90s had installations in Spain. Italy, England, Germany, the Netherlands, and Russia. The relationships built in the past paid off. What factors led to success in the international market? Hard work. Nothing is accomplished without it. An understanding of the country and its culture. Partnering with reputable companies in each country and requiring they establish a staff to service the equipment sold. Willingness to adapt our equipment to meet local conditions and traditions. Determination to exceed the quality, reliability, and features of manufacturers of cremation supplies within the country. How successful has our strategy been? Over the past five years, half of our crematory business has come from the international market. We have enjoyed immense success in Brazil where we are the largest supplier of cremation equipment. Australia has become a major market for us. And in September we completed our first installation in Malaysia. I tell you of our journey and its rewards because it can be your story, too. Building business beyond our borders is a marathon effort, not a sprint. But it is well worth the time, attention and resources required- Opportunities exist where you might not have expected them. Recognizing potential is the first step in your journey.